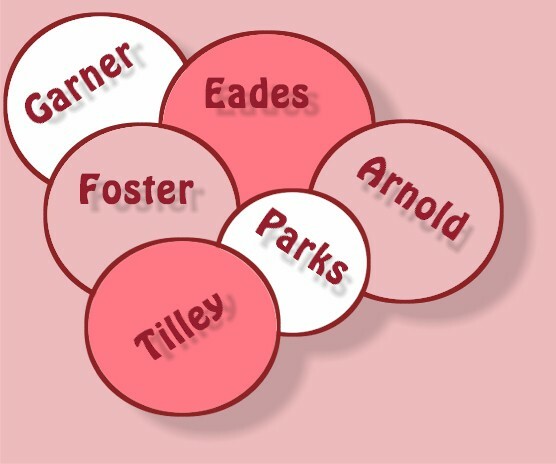 My ancestor - Lucinda Arnold Tilley - was part of the Arnold's of Wayne County, Tennessee. Lucinda was the daughter of James Arnold Sr. and Nancy Thorton whom are mentioned below. Jefferson Arnold came to Izard County, AR, between 1846-49 from Wayne County, TN. He was born in 1804, the son of James Arnold and Nancy Thorton Arnold. He was a farmer and reared his family in the south part of Izard County in the Mt. Olive and White River townships. Jefferson was not only a farmer but a school teacher and a minister of the Missionary Baptist Church. His first wife died approximately 1849 after the birth of their baby daughter, Sarah C. Arnold. Jefferson's three brothers: Reuben, Thomas and Michagah Arnold also migrated to Izard County, AR. At least two other brothers, John Arnold and William Arnold, plus two sisters, Sarah Arnold Hollandsworth and Nancy Emeline Arnold remained with their parents in Wayne County, TN. Jefferson and his first wife were the parents of two sons and six daughters. They were: Matthew T.Arnold (born 1827) married Nancy; Celia "Lydia" J. Arnold (born 1830) married a Sisk. Their children were Noah, Jefferson, Josiah and Margaret Sisk. James "Jim" Henry Arnold (born Feb. 6, 1832) married Jane Waxter Daniel; Emeline Arnold (born 1837); Levina A. Arnold (born 1839) married William Primm; Caroline Arnold (born 1842); Franky Arnold (born 1846) and Sarah C. Arnold (born 1849). On Jan. 30, 1860, Jefferson married Mary Jane Prinner. Three children were born to this union. Ally Arnold (born 1864), Jefferson Arnold (born 1870) and Nancy J. Arnold (born 1875). Nancy married James H. Ramsey on June 5, 1890. At the time of Nancy and James' marriage they lived at Adler.AR. 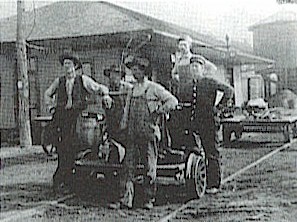 In the late 1800s and early 1900s Jim Henry Arnold's son, John David Arnold, and grandson of Jefferson Arnold worked on the railroad at Guion, AR. Submitted by Helen Mize Christian. Elisha Arnold (born Sept. 21, 1808, died April 13,1875) married Mary M. Kirwin (born Jan. 1, 1811, died 1878). Both were born in Virginia. They were on Izard County, Rocky Bayou Township census in 1850 with eight children: Lucy Ann, 18; William Joseph, 16; John Lucus, 13; Thomas, 12; Mel-issa, 10; Martha, 8; Edwin, 5; and Narcissa, 2. Lucy was born in Virginia and the others in Tennessee. On the 1860 Census was Susan, 7, born in Arkansas. Edwin apparently had died before 1860. James Claybourne was born and died in Tennessee (born June 20, 1836, died July 15, 1837). Elisha had a sister, Martha H. Arnold, born in 1811 in Virginia who married Steve Taylor, born 1808 in North Carolina. Their father was Joseph A.Arnold. Records show the following information about Elisha's adult children: Lucy Ann F. (born April 24, 1833) married William Bailey Marchant (born 1830 in Bedford/Williamson County, TN); William Joseph "W. Jo" (born Nov. 8, 1834, died Nov. 10, 1913) married Rebecca Jane Landers (born Nov. 3, 1836, died Aug. 6, 1905) Oct. 9, 1856; John Lucus (born Jan. 24, 1838) married Virginia ?? (born about 1842); Thomas G. (born Jan. 24,1840), Malissa Jane (born Jan. 13, 1842) married (1) William T. Hobgood (born about 1832, died about 1867), married (2) William J. Arnold (born July 1834) (this was apparently why Elisha's son was always known as "W. Jo"); Martha Green (born about December 1842) married G.W. Thurman; Narcissa J. (born about 1848, died 1933) married Benjamin M. Williams (born about 1844) and Susan E. (born about 1853) married Samuel C. Majors. Wm. 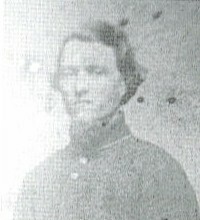 J. Arnold ("W. Jo"), Pvt., Co. F, Freeman's Regt. a paroled prisoner of the Army of the Northern Sub District of Arkansas, "has permission to go to his home, and there remain undisturbed" at Jacksonport, AR, June 5, 1865. Description, age 30, hazel eyes, dark hair and complexion, height 5'10". When Elisha died, he owned a general store and Lots 4 and 5 in Lunenburg and 680 acres of land in Izard County. His son, "W. Jo", was appointed administrator of his estate as requested in his will of April 27, 1874. Family records show several hundred dollars of outstanding debts were on the general store books. Many were collected but "worthless notes amounting to $429.10" were never collected. Mary M. was allotted her widow's dower and assets were divided among other heirs located as follows: Lucy Ann Marchant, William J. "W. Jo" Arnold, Melissa J. Arnold, Narcissa J. Williams and Susan Majors, all in Izard County; Thomas E. Arnold in Sharp County, AR; and John L. Arnold and Martha G. Thurman in Missouri. "W. Jo" Arnold was appointed as one of three commissioners to lay off dower land for some of the Mary M. Bigham estate, one mile east of present Melbourne near Mill Creek. Her husband, Samuel S. Bigham, left for Civil War duty and did not return. It has been learned in later years that he was killed in a Southern Missouri battle. On Dec. 11, 1891, "W. Jo" bought 118 acres of the Bigham estate, that had a two-story, two-log pen house that still stands. It was built in the 1850s by what is now known as the Arnold Spring. He and his wife, Rebecca, are buried in Melbourne Cemetery. Much of this information was derived from old records, inventories, tax receipts, court proceedings, documents, deeds and etc. that are still in the possession of Elisha's great-great-granddaughter, Ina Jennings Ramsey. She and her husband, William A. "Dub" Ramsey live on the Arnold land now. Submitted by Risa Dawn Ramsey. James "Jim" Henry Arnold, the son of Jefferson Arnold, was born Feb. 6, 1832, in Wayne County, TN. 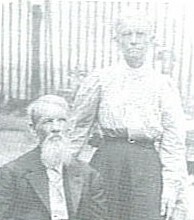 Jim married Jane Waxter Daniel in 1860, in Izard County, AR. Jane was born Feb. 8, 1843, the daughter of Drury and Catharine Daniel. Jane died March 20, 1908, and is buried near Springhill, Wagoner County, Oklahoma. On Nov. 1, 1861, Jim Arnold enlisted in Co. F Regt., 7th Bn. of Col. Desha's Inf., as a Confederate soldier during the Civil War. He was captured in 1862. Captured again July 4, 1863, at Vicksburg, MS, and on Nov. 25, 1863, he was captured at Jacksonport, AR. This time he was sent to Point Lookout, MD, as a prisoner-of-war. He was transferred for exchange on April 11, 1865, at Cairo, IL. He applied for a Confederate pension on May 22, 1901, and was awarded an annual pension of $25 by the Izard County, AR, Board. Jim and Jane Arnold were the parents of seven children who were all born in Izard County except Joseph and John David. William Edward "Ed" Arnold (born Oct. 18, 1860) married Elizabeth Treat; Joseph Henry Arnold (born Dec. 25, 1865, in Illinois, died Aug. 3, 1886); Thomas "Tom" Newton Arnold (born May 12, 1868) married Mary Allener George; Sarah Elizabeth Arnold (born Feb. 9, 1871) married Henry Treat, James Ervin Arnold (born Jan. 14, 1873) married Millissa Ellen Banning Davis; John David Arnold (born Jan. 24, 1875, in Howell County, MO) married Perlie May Cooper; and Biddie Emmaline Arnold (born Nov. 27, 1877) married Charles Edward Dale. 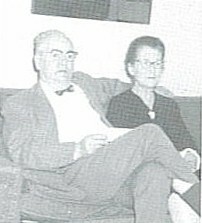 Jim and Jane Arnold lived at Anderson, AR, now Lafferty, in the southern part of Izard County. Jim died in 1907 at the age of 75. Submitted by J.B. Mize. Arnold Family, Dec. 25, 1916. Pictured from left to right: Shelby Arnold, Arther Williams (son-in-law), Ethel (Quails) Arnold, Henry Quails (Ethel's husband holding their daughter, Ellie Mae), Agnes Arnold with son Jewel! (in front of Agnes), Robert Arnold, George Quails (half-brother to James Robert Sr.), Tom Arnold and his four children: Thurman, Ollie, Faye and Elsie (in front of Tom), William Quails (Maghetti's husband, in back beside Tom), Eldon Arnold, George Arnold, William Homer Arnold, Maghetti (Arnold) Quails (holding son William), Leona (Arnold) Taylor (holding son Ben), Zelphie and Carlton (in front of their mother, Leona), Sam Taylor (Leona's husband, at end), Grandfather James Robert Arnold and Grandmother (Underdown) Arnold (sitting in front). 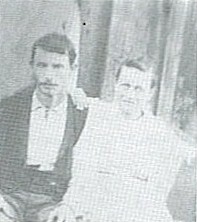 James Robert Arnold, son of John Thomas Arnold and Elizabeth Collins Arnold, both were originally from Tennessee. James was born in January 1857 in Missouri and later moved to Arkansas with his mother sometime between 1857-80. His father, John Thomas, left home one day to go hunting and was never seen or heard from again. Records in Sharp County indicate that James hired out to do farm work for a Mary L. Moody in 1880. James married Florence Underdown in 1882 in Sharp County. The Izard County census shows he lived in the Strawberry Township in 1900. James was a farmer and served as a justice of the peace in the Strawberry Township from 1914-20. James and Florence had 14 children, four of which died during childhood and are buried at the Bear Creek Cemetery in Sharp County. The remaining 10, listed below, lived in the Sharp and Izard counties where they raised their families. John Thomas (born May 1884), Leona (born January 1888), Agnes (born September 1888), Robert (born October 1889), Ethel (born February 1893), Maghetti (born June 1895), George (born January 1897), Shelby (born September 1897), Homer (born April 1903) and Eldon (born January 1905). James died in February 1922 from kidney stones and is buried at the Bear Creek Cemetery along with his wife who passed away several years later and their young children that had died early in life. All 10 children have extended families throughout Izard, Sharp and Independence counties. Homer Arnold, the 14th child of James and Florence, remembered his dad performing wedding ceremonies in their home in Izard County for people such as Verge Foster and Dot McAnally, Buddy King and Myrtle Crisco and Lee Marlin and Nancy Davis who were all residents of Izard County. Homer followed his fathers' footsteps and was a farmer in Izard County for many years. 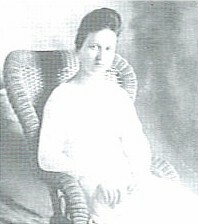 Homer Arnold married Audie Felton, daughter of Nathan Felton and Mary Graves of Izard County. Homer and Audie had six children which were all born at home in Izard County: Euna Mae (born Nov. 15, 1929), Alma Marie (born Feb. 1, 1933), William Wesley (born Aug. 29, 1935), Florence Christine (born Jan. 29, 1940, died May 1988), Lawrence Dean (born Sept. 23,1944) and James Lon (born Sept. 6, 1948) all of which currently reside in Izard County. 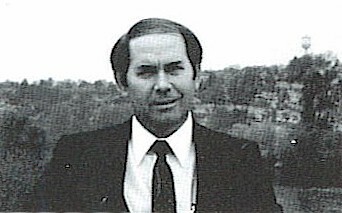 Lawrence Dean "Larry" Arnold, Izard County judge, 1979-82. Larry Arnold served as county judge from 1979-82. Audie (Felton) Arnold still lives at Franklin and is 87 years old. Homer Arnold died in January 1988 and is buried in the Robert's Cemetery in Franklin, AR. This information provided by Marie (Arnold) Bailey. Three generations, R. Hosea Arnold, Ina (Jennings) Ramsey and Ethyl Jennings. Richard Hosea Thayer Arnold was born in Lunenburg June 19, 1871, and died Oct. 14, 1934, the son of William Joseph "W. Jo" Arnold (born Nov. 8, 1834, died Nov. 10, 1913) and Rebecca Jane Landers (born Nov. 3, 1836, died Aug. 6, 1905), married Oct. 9, 1856. R. Hosea was a Mill Creek Township justice of the peace for several years and performed many marriage ceremonies. He also ran for Izard County judge twice in the 1920s but was not elected. Siblings were Martha Rowland (born March 23, 1858, died Jan. 21, 1907) married (1) John W.P. Jones (born April 30, 1884), married (2) G.A. Jenkins (born July 16, 1905); Mary Jane (born June 11, 1861, died February 1904) never married; William Elisha Baxter (born Dec. 5, 1863) married Lizzie E. Bevans Feb. 24, 1889; Dr. John Franklin (born Sept. 23, 1867, died Sept. 19, 1892); Charlottie Ann (born March 26,1873) married James E. VanattaAug. 5, 1891; andAlbinea Beatrice (born Sept. 5, 1877, died Feb. 25, 1908) married Charles E. Landers (born Jan. 10, 1879, died Aug. 26, 1952) March 5, 1905. On Sept. 9, 1906, R. Hosea married Emma May Spurgin (born Feb. 6, 1881, died July 26, 1967) at Jumbo, daughter of Samuel Evans Spurgin (born Sept. 13, 1841 in Tennessee, died Jan. 4, 1912_ and Cornelia Adaline Fears (born . 6, 1848 in Alabama, raised in Mississippi, died Dec. 4, 1930). Twenty years after Samuel returned from the Civil War, a bullet he received in his left eye worked its way out into his mouth. After the left eye was shot, he was put back on the firing line because he had his right eye to shoot with. Samuel and Cornelia are buried in Combs Cemetery. The R.H. Arnolds raised a family on their farm one mile east of Melbourne. Their two-story log house was built before the Civil War and still stands at the Arnold Springs. The big spring was the source of the city of Melbourne's water system from 1947-97. They had an orchard business in the early 1900s and sold seedlings; pecan trees and yucca plants (blades were used to tie bundles) are still living on the place. Children of R.H. and Emma were: Willie Vaden (born Feb. 17, 1908, died March 26, 1989) married Willie Oscar "Bill Buck" Wammack (born June 3, 1902, died Aug. 14, 1963) Feb. 6. 1926; Mary Ethyl (born July 10, 1910, died April 21, 1985) married Talmage Deloyce Jennings (born March 2, 1907, died June 16, 1991) Feb. 7, 1926; Joseph Evans (born Nov. 28, 1913, died Feb. 24, 1982) married Lela Joyce Exum (born Oct. 3, 1910) April 8, 1939. All the above are buried in Caney Springs Cemetery except Joseph. Lela lives in Salem. Children were born only to the Jennings'; Two sons who died in infancy are buried in Caney Springs Cemetery; daughters; Ina Clarine (born June 16, 1932) married William A. Ramsey (born JulyS, 1928), (son of Samuel Nelson and Emma Herron Ramsey) Sept. 3, 1955. Children, Brent (born Aug. 10, 1956, died Aug. 11, 1956) is buried in Violet Hill Cemetery; born in Perryville, MO, were Risa Dawn (born Sept. 29, 1962) and Arnold Jennings (born Jan. 3, 1965) married Kimberly Ann Bradshaw (born March 22, 1967), (daughter of Fred and Mary Bradshaw of Louisville, KY), June 5, 1999, in Durham, NC. Matra Lorene (born June 15, 1935) married (1) Fillmore Price Hodge (born Feb. 4,1931, died Feb. 23, 1981) Dec. 10, 1959. Children: Patricia Ann (born Nov. 18, 1960, died Nov. 10, 1971); Phyllis Marie (born Nov. 8, 1961) married four times; Galen Lloyd (born July 8, 1963) married Karen Marie Mullin (born July 11, 1958) July 5, 1986; Rebecca Kay (born Feb. 7, 1966) married Dale Darr (born April 20, 1964) Aug. 14, 1987, in Texas; Ellen Ruth (born April 9, 1969) married Connie Fay "BB" Johnson (born Aug. 18, 1964) Aug. 11, 1990. Matra later married (2) Arthur Ogg. Richard Hosea, his wife, his parents, and sisters, Mary Jane and Albinea, son, Joseph E. and great-granddaughter, Patricia, are all buried in Melbourne Cemetery. Mary Ethyl Jennings and husband lived on the remaining part of the Arnold Spring farm until their deaths. Their daughter, Ina and husband, presently live there. Submitted by Arnold Jennings Ramsey. John David Arnold, born Jan. 24, 1875, in Howell County, MO, the son of James "Jim" Henry Arnold and Jane Waxter Daniel Arnold. John married Perlie May Cooper on Aug. 30, 1898, in Izard County, AR. Perlie May was born July 28, 1882, in Izard County, AR, the daughter of Stephen Allen Douglas "Doug" Cooper and Susan Cathrine "Cassie" Chappell. She died from pneumonia on Dec. 23, 1909, atAnderson, AR. She is buried next to their son, Eugene Ervin Arnold, in the Hassell Cemetery near current Lafferty, AR. John David died Dec. 25, 1961, and is buried in the Boatman Cemetery near Locust Grove, Mayes County, OK.
John and Perlie Arnold were the parents of six children who were all born in Izard County, AR. Their first child died at birth. Eugene Ervin Arnold (born Sept. 6, 1900, died Sept. 13, 1909, of spinal meningitis); Effie Aillener Arnold (born Feb. 25, 1903, died May 22, 1957); James Hurkless Arnold (born Dec. 20, 1904, died Sept. 30, 1989); Frankie Mae Arnold (born Dec. 11, 1906, died Dec. 18, 1983); and Attie Wilma Arnold (born Oct. 31, 1908, died May 12, 1981). Effie A. Arnold married Jessee Floyd "Spud" Mize on Dec. 19, 1920. Effie and "Spud" Mize are buried in the Bixby, Tulsa County, OK, Cemetery. James "Hurkless" Arnold married Opal (DeBoard) Henry on Aug. 4, 1966. He is buried next to his father in the Boatman Cemetery. Frankie Mae Arnold married Frank Weaver on Dec. 16, 1925. She and Frank are both buried in the New Home Cemetery at Peggs, Cherokee County, OK. Attie "Wilma" Arnold married Louis C. Wing on March 7, 1927, and she remarried to Louie Lansin Daniels on Dec. 2, 1940. Wilma and Louie are both buried in the Dewey Cemetery, Washington County, OK.
John David Arnold remarried Dec. 28, 1912, in Guion, Izard County, AR, to Alice Elizabeth Eary. Alice was the daughter of Roan E. Eary and Jenettie Bell Eary. 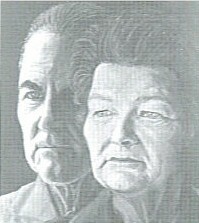 John and Alice Arnold were the parents of one daughter and six sons. They were: Essie May Arnold (born June 27, 1914, in Izard County) married Estes Abe Harris. She died Sept. 4, 1981, and she and Abe are both buried in the Hogan Cemetery. Earl Ray Arnold (born April 2, 1917) married Edna Norwood. Ray died in 1989 of cancer and is buried in the Hogan Cemetery. Walter Luther Arnold (born May 4, 1919) married Ruth Arlene Frazier. He died June 10, 1988, and is buried in the Hogan Cemetery. William Burl Arnold (born March 11, 1921) married Betty L. Dinsmore. Burl died July 29, 1997, and is buried in the Hogan Cemetery. Wesley Arlo Arnold (born Jan. 21, 1923) married Beatrice Pauline Turner. Arlo died Sept. 3, 1987, and is buried in the Hogan Cemetery. Leslie Ewing Arnold (born Feb. 4, 1925) married Betty Jean Johnson and J.D. Arnold (born Sept. 14, 1931, died Feb. 10, 1987). He is buried in the Hogan Cemetery. Alice Elizabeth Arnold died July 23, 1985, and is buried in the Hogan Cemetery near Locust Grove, Mayes County, OK. Submitted by Gary Don Christian. Jay (born 1894, died 1970) and Nancy Q. (born 1897, died 1990) Arnold lived most of their married life in Izard County, AR. They were married March 16, 1915, at Norfork and moved frequently during their early years together. They lived in Guion three times � but were driven out first by a flood in 1926, then by the infamous tornado of 1929 before returning in 1944. In 1945 they built a house at River Road and Main, now located between Guion's Methodist Church and its Baptist Church, that would be their home for the remainder of their lives. Jay and Nancy were the parents of Jay G. (born 1916, died 1945); Geneva (Rodman) of Leachville.AR; Beverly (Hurst) of Blacksburg, VA; Jackie (Hunt) (born 1924, died 1996); Rogers of El Paso, TX; Jaydine (Morion) and Va Rue (Guthrie) of Melbourne, AR. Nancy was born in Indian Territory (Oklahoma) the daughter of Athelston and Josie (Robertson) Rogers. Jay was born in Big Flat, AR, the oldest child of Alex (born 1867, died 1927) and Lucy (Griffin) (born 1876, died 1957) Arnold of Baxter County, AR. Their other children were May (King), Myrtle, Griffin, Willie (Dwelle), Ruth, Mertie (Harris), Ruby (Berry), Bonnie (Weaver) and Reuben. Jay was variously employed as a farmer, teacher, merchant and clerk for Silica Products of Guion. Nancy was Guion's postmaster from 1949-67. Jay's sister, Mertie, was first married to D.D. Dunkin, a graduate of Rolla School of Mines and owner of Silica Products. She later married Al M. Harris who served as Guion's mayor after his retirement from the Missouri Pacific Railroad. Jay's sister, Ruby, lived in Guion while her husband, Johnny Berry worked for Silica. His sister, Bonnie, married Guion citizen, Bill Weaver, who was a trucking contractor for Silica and operated the Guion Water Dept. Jay's brother, Griffin, left farming in Baxter County about 1950 and worked for Silica until his retirement. Jay Arnold is the great-grandson of Reuben Arnold, who first settled in Izard County, in the middle 1840s. Reuben came from Wayne County, TN, with his wife and children. Several of Reuben's brothers were also early settlers to the area. It is believed they traveled up the White River on The General Morgan and landed, around 1846 at the mouth of Hidden Creek which is at the north end of what is now known as Guion's Mid Haws Landing Park. 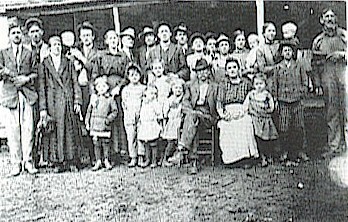 Reuben and his family settled first on Lyons Creek, just west of Hidden Creek. It was while living here that Reuben's son, Jefferson, began courting his future wife, Rebecca. By Larry Morion. Griffin Alexander Arnold born Dec. 24, 1900, at jka and died Jan. 13, 1987. Thelma Lorena Berry Arnold born Aug. 13, 1906, at Calico Rock and died July 28,1982. They were married June 12, 1926. Griffin was the son of James Alexander Arnold and Lucinda (Griffin) Arnold. Thelma was the daughter of Henry Berry and Annie (Stoner) Berry. Griffin was a farmer near Old Joe and worked on construction of dams at various times in Arkansas, Colorado and Wyoming. He moved to Guion in 1952 to contract hauling sand. He later was Superintendent of the Sand Plant. He retired to farm and raise cattle at Violet Hill. His last move was to Salem. Thelma was a housewife for most of her lifetime. They had five children: Robbie Nelle (born March 21, 1927), Glenn Auburn (born Nov. 17, 1928, died Dec. 31, 1974), Helen Rose (born March 15, 1931, died Jan. 28, 1999), Carl Berry (born Nov. 27, 1932) and Jack Austin (born Sept. 14, 1941). Robbie married Glacen Thuron May on Nov. 27, 1947. Her career was teaching elementary school. They had four children, three of whom did not survive to adulthood. They are: Dennis Noel (born Dec. 21, 1949, died Dec. 27, 1949), Joel David (born Oct. 18, 1951, died Dec. 3, 1963), Maxwell Glacen (born May 7, 1956, died Nov. 11, 1973) and Susan JoAnna (born Feb. 23, 1965). Susan also teaches elementary school. On Nov. 22, 1989, she married Michael Hemme. They have three children: Shane Matthew (born Feb. 16, 1993), Erin May (born Dec. 29, 1994) and Payton Michael (born Oct. 7, 1997). All live in Mountain Home. Glenn married Nancy Sue Rogers on Aug. 29, 1949. Glenn spent the most of his career building houses in West Memphis, Forrest City and Jonesboro. He died in Jonesboro. They had two sons, Gerald Anthony (born Nov. 18, 1952) and Kent Erwin (born Dec. 28,1955). Gerald has been married three times, currently to Terry. He has one daughter, Haley Danielle (born Feb. 16, 1989) by his second wife. Kent married Jeanne McQueen on June 5, 1976. They live in Jonesboro and have two children, Brooke McQueen (born April 27, 1979) and Kent Auburn (born May 1, 1981). Helen married Howard Vernon Fitzpatrick on Aug. 21, 1949, and spent her life being a housewife. She died while living in Oxford. They had three sons: Edward Glen (born Jan. 9, 1952), Keith Wayne (born Dec. 22, 1955) and Carl Howard (born July 19, 1950, died at 2 months of age). Edward first married Dolores van Tuyl and they had three children: Sasha Edee Donner (who has a child), James and Eliza. Edward is currently married to Pamela (Soper) and they have four children: Joshua, Quinetta, JoAnna and Christina. They live in Oxford. Dr. Carl married Nola Corene Lamb (called Norene) on Aug. 30, 1957. He has spent his career as a physician in Salem. They have three children: Griffin Alexander II (born Sept. 4, 1958), Cynthia Gaye (born April 6, 1961) and Medford Carl (born Oct. 14, 1971). Griffin, also a physician and his wife, Renee, live in Salem and have two sons, Robert and Matthew. Cynthia Arnold Southard and her husband, Bob, have a son, Brent. Jack married Mary June Jeffery on Dec. 26, 1962. He spent his career teaching secondary school. They have two sons, Dallas Aaron (born Nov. 16, 1964) and Jeffery Arend (born June 12, 1967). Both sons likewise are teachers. Dallas married JannieceAllene Briggs on Aug. 15, 1987, and they have three daughters: Sarah Katherine (born Nov. 22, 1990), Ashley Elizabeth (born March 29, 1993) and Rachel Frances (born Oct. 3, 1995). Jeffery married Marsha Lynne Green on Aug. 23, 1987, and they have two children, Leah Faith (born July 4, 1993) and Forrest William (born Feb. 1, 1996). All live in Mountain Home. Written and submitted by Jack Arnold. Effie Aillener Arnold, a native of Izard County, AR, was born Feb. 25, 1903. She was the daughter of John David Arnold and Perlie May Cooper. When Effie was 6 years old her mother died from pneumonia. Effie learned quickly how to help her father with her smaller brother, Hurkless Arnold, and two sisters, Frankie and Wilma. In 1909, her father, a widower, moved his family to Springhill, Wagoner County, OK, to live near his two broilleib, Torn and Ervin Arnold. In 1912 John David Arnold returned to Izard County, AR. He remarried on Dec. 28, 1912, in Guion, AR, to Alice Elizabeth Eary. He farmed and worked on the railroad at Guion. 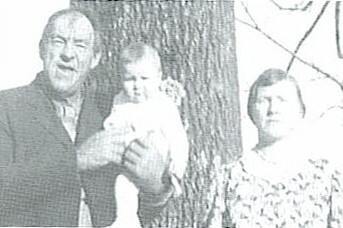 In 1917 John David and Alice Arnold, with a new baby daughter, Essie Mae Arnold, left Izard County for Peggs, Cherokee County, OK. Effie, Hurkless, Frankie and Wilma moved with them. Effie married Jesse Floyd "Spud" Mize on Dec. 29, 1920. Their children were: Jesse Floyd Mize Jr. (born March 27, 1930, died April 3, 1930); Gladys Louise Mize (born Feb. 2, 1932) married Jack Kulp; J.B. Mize (born Jan. 7, 1934) married Bonnie Darlene Tuttle; Glenn Howard Mize (born Jan. 11, 1936) married Barbara Ruth Roberts; Hazel Mae Mize (born March 4, 1938) married James Woodrow Daniel; she later married John Newman Kerr; and Helen Fay Mize (born Oct. 31, 1943) married Donald Ray Christian on Nov. 4, 1961. J.B. and Darlene Mize are the parents of two children, Ronnie Wayne Mize (born Sept. 8,1959) and Sherri Denise Mize (born Oct. 26, 1962). Glenn and Barbara Mize have four children: Jerry Glenn Mize (born Dec. 9, 1954), Tony Edward Mize (born March 19, 1956), Teresa Jane Mize (born Oct. 11, 1957) and Mark Alien Mize (born Dec. 21, 1962). Hazel and Woody Daniel have one child, Cindy Gail Daniel (born April 6, 1967). Hazel and John Kerr have one son, Michael Jonathan Kerr (born Oct. 11, 1978). Helen and Don Christian are the parents of two children, Gary Don Christian (born June 27, 1966) and Carolyn Beth Christian (born April 15, 1969). Gary married Tracy Lynn Teague on Sept. 19,1992. Their children are, Jessica Lauren Christian (born Jan. 19, 1994) and Josie Lynn Christian (born July 22, 1996). Carolyn Christian married Steven Earl Scott July 30, 1988. Their children are: Brittany Nichole Scott (born March 22, 1990), Steven Ryan Christian Scott (born Aug. 9, 1996) and Katie Michelle Scott (born July 20, 1998). "Spud" Mize was born Jan. 13, 1902, Indian Territory, near current Peggs, Cherokee County, OK. He died June 22, 1957, from leukemia. Effie died May 22, 1957, in the Western Oklahoma Tuberculosis Sanitarium at Clinton, OK. She had rheumatoid arthritis several years before she died. Both are buried in the Bixby Cemetery, Tulsa County, OK. Submitted by Carolyn Beth Scott. 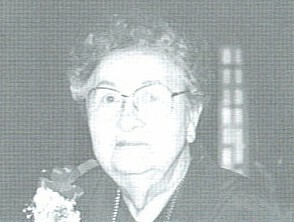 Eunice Arnold born Nov. 7, 1908, in luka, AR. Her parents were Alex and Lucinda (Griffin) Arnold. Mertie attended school in Norfork and went to Mountain Home Baptist College and Northeastern Oklahoma Teachers College in Tahlequah, OK. While teaching school in Guion, Mertie met and married (March 1927) Damon Duffield Dunkin. Mr. Dunkin owned and operated the sand company, Silica Products Company, Inc., Guion, AR. As early as 1927, it was asked that Guion Road in Izard County be taken in by the state, but it took nearly 40 years to see that happen. In 1927 the sand company was the largest industry in Izard County, and Guion was a busy place. Mr. and Mrs. Dunkin had two daughters, Ida Kate (born April 8, 1929) and Delia Mae (born May 24, 1932). When Delia Mae was 1 year and 4 months old, Mr. Dunkin died (Sept. 13, 1933). His death may have been caused by the stress and extra work brought on by the tornado of 1929 that destroyed the sand mill. Mertie was left to rear her young daughters and manage the sand business in the same month that Mr. Dunkin died, she was elected president of the company. The job required extensive travel. The family lived in Batesville and Little Rock, but they kept a company home in Guion. Ida Kate married Sam Cooke (born March 10, 1929) in 1950, and they live in Batesville and have four children: Becky Falkowski (born March 9, 1952), Dr. Sam Cooke (born Sept. 7, 1954), John Cooke (born June 10, 1957) and Mary Boushelle (born June 28, 1965). Sam and Ida Kate have nine grandchildren. Delia Mae married George Dortch II (born Aug. 21, 1931) in 1955 and they also live in Batesville. They have two sons, George Dortch III (born Nov. 3, 1958) and Damon Dortch (born Jan. 4, 1962). George and Delia Mae have one grandson. In spite of hardships, such as a fire that destroyed the sand mill in 1942, Mertie did many things for the town of Guion. She would encourage the townspeople by promising to match their funds. That is how Guion got their streets paved, the Wild Haws Ferry and many other projects. Mertie also wrote the History of Guion for the Izard County Historical Society. Mertie later married Al M. Harris who was employed by the Missouri Pacific Railroad Company. They lived in Little Rock until 1965 when they built their dream house at the top of the hill in Guion. Mr. Harris was elected Mayor of Guion, and the Guion Road was finally paved and became Highway 58 which eventually set the ground work for getting a bridge across White River and Highway 58 paved in Stone County. After operating Silica Products Company, Inc. for 36 years, Mertie retired, leaving the business to her sons-in-law, Sam Cooke in 1958, and George Dortch II in 1963. It was sold in 1989 to UNIMIN which is based in Belgium. It goes by that name today. Mertie lives in Batesville near her children. She has 10 great-grandchildren. Written and submitted by Kate Cooke.